I’ve been punning since I was a cunning nine-month old baby girl, babbling “stuck you!” to my mother after she quarantined me in my playpen. Since then, I’ve taken every op-pun-tunity to hammer out my craft with words and wit. Don’t worry, it’s not all work and no wordplay — being a wordsmith is my joie de vivre. So when I learned of the Punderdome 3000, a monthly com-pun-tetition in Brooklyn, N.Y., it was one of the few moments in my life where I felt unequivocally compelled to attend. And now, after battling mostly male word warriors over three evenings, I want to tell you my story. Maybe there was something electromagnetic in the night air, kindling my confidence and setting ablaze a desire to participate. Maybe it was the crowd, a jury of my peers who came to support words, sport, and all-over corniness. Maybe it was the career calling I never had as a former advertising copywriter and current journalism grad student. Whatever it was, there I was: on stage with a white board and marker and 90 seconds to come up with as many puns as possible. Let me take a step back and talk a little bit more about the rules at Punderdome. A category is assigned for each round and after your 90 seconds, you have three minutes at the mic. Performances are scored by the clapometer, an unscientific measurement of audience response manned (or woman-ed) by a person in a blindfold. Battles mount as the competition takes height, and the best punners trade euphemisms, catechisms, and wow-isms until winner takes all. That night, I had the unfortunate luck of going in the first heat of the first round with five others. Our category, cleaning, was assigned by Jo Firestone — the delightfully polite Brooklyn-based comedienne and Punderdome cofounder. Jo hosts the gig with her dad, Fred, who runs business seminars by day and memorizes Rodney Dangerfield jokes at night. Given that I had no time to prep and even less to observe, I went for volume. The most puns wins, right? Except that I fell into a vacuum of angst, windexing and waning on what to say. Do you know how fast 90 seconds goes? I said a prayer to Mr. Clean and dust-busted out a few somewhat clever one-liners before mopping off stage. Had I actually said any of the aforementioned puns I might have gotten more than a meager, pitying clapometer score. But my competitive instincts were roused as I watched Punky Brewster, Punda Express, and Forest Wittyker clean up, delivering polished puns that never tarnished on stage (winner: Wittyker). I vowed with the deep-rooted determination of an old oak tree that I’d be back next month. In the meantime I sought out the masters, beginning with John Pollack, past Punderdome judge and author of The Pun Also Rises. The winner of the 1995 O’Henry Pun-Off World Championships (a Spartan feat) met me for coffee and talked about how puns are more than just wordplay; as figures of speech they contributed to the rise of civilization. According to Pollack, scribes in ancient Egypt and Mesopotamia used puns to break apart sound, symbol, and meaning from hieroglyphics, harvesting their phonetic value and reusing them for their own purposes. His book cites the work of Jared Diamond, who wrote in his book, Guns, Germs and Steel, that Sumerian scribes created the verb “to eat” by combining pictogram signs for bread and head. Phonetic punning like this led to the eventual creation of the written alphabet, which allowed people to “write down ideas of infinite complexity and transmit them over time,” he says, which in turn accelerated the accumulation of these ideas. Punning is an intensely creative process, he tells me, as it establishes associations between two very disparate ideas. “The mental acrobatics that your mind has to somersault to get to a good pun is awesome,” he says. “They are really complex.” Perfect puns are contextually relevant and economical expressions, making wild, in-the-moment leaps between topics based on phonetic links, he says. Brunch, craisins, mathletes, spork, smog: these hybrid words prove that good puns come in small packages. “The best puns are in the moment,” Pollack tells me, and he and I exchanged a pre-pun-derance of stories on our coffee date, including me sharing one of my most pride-worthy puns from ’08. Back then I was on a kickball team with some coworkers, and during one game this larger guy heckled the hell out of us from the outfield. Luckily, his intimidating demeanor fouled out when he stepped up to the plate. The fool half-tripped, half-bunted (trunted?) into the ball as it came toward him. I yelled out, “his BULK was worse than his BITE!” Pollack smiled slightly in response, but I knew my retort had hit a home run. I couldn’t let my first flop be my only attempt at Punderdome mastery, so next month I returned to the show. 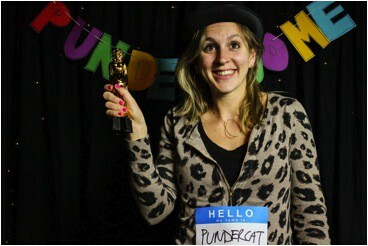 I tried on a different alter ego this time, Pundercat, to elicit some superhero powers and rev up my creativity. But this crowd seemed bigger, more judgmental, and ready to roar. I sharpened my Pundercat claws, preparing to take a bite out of the competition and to litter my presentation with puns. Jo and Fred heckled me a bit: what’s your name, what does it feel like to be a girl, how’s the weather, whatever. I was rattled, and tightened the grip on my marker. The category: cigarettes. Wittyker incorporated a narrative into his presentation last time, so I tried to do the same. I briefly got the crowd on my side when I asked them “Cig-aren’t you glad to see me?” and acknowledged the American Spirit running through the audience. But then I burned out, unable to think of anything but a bunch of four-letter words that had nothing to do with cigarettes. I puffed my way through a few more sentences before smoldering off stage. It was a bona fide Lucky Strike out, no butts about it. Following my Punderdome two-ppearance, I approached Jo Firestone for a ruthless pun-formance critique. “Confidence is king as the Punderdome,” she tells me, and I might have achieved third-round stardom if I’d acquired a little more bravado. “You’re one of three women competing,” she says, which both helps and hurts how I do on stage. Maybe I should try a partner, she suggests, so I feel more comfortable. With that clever coaching, I returned to Punderdome for a third time. My new friend John Pollack was a celebrity judge that night, and wished upon a stage that I would present fairy well. This time the category was moving, and thanks to a long overdue sojourn in an abysmal New York City tenement, I had ample fodder. I told the crowd that the idea of moving made me so boxed up inside, and when I lamented, “Aww, rats!” they chuckled. Things really heated up when my boiler died, but apartment from other things I proclaimed, “super!” when I finally did move. This time, my clapometer score was better than ever, but I still didn’t go any further than Round 1. So what can I say about my own Punderdome experiences? Pun-tificating on my three tries, I haven’t zeroed in on how to be number one, but darn it, I’m not giving up. Competitive punning is a spectacular sport for the strong-witted, and practice makes pun-fect, right? “I think there’s a sense of ownership that a lot of people have for Punderdome,” Jo Firestone tells me, and I ebulliently agree. There’s a Punderdome coming up next week. I’ll be there, wordplay-ing to win. Alexa C. Kurzius is a science writer and pun lover living in New York City.